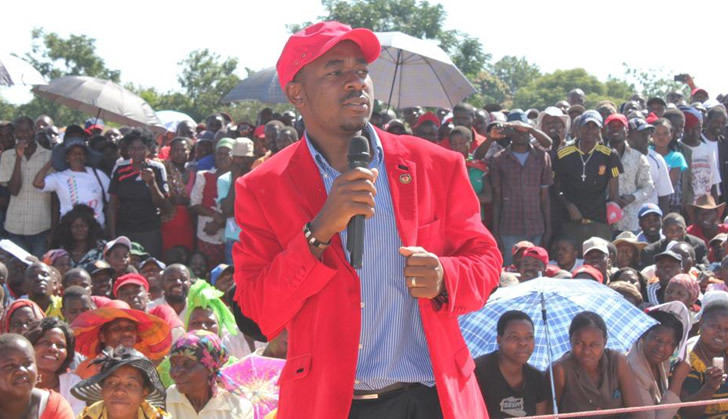 MDC-T leader Nelson Chamisa stirred controversy during his recent campaign trail in Bulawayo. Chamisa paid homage to prominent political figures and families, among them a respected freedom fighter and former Chairperson of the Zimbabwe National Liberation War Veterans Association Jabulani Sibanda. Chamisa used this opportunity to visit Father Zimbabwe Dr Joshua Nkomo's memorial museum in Matshamhlope. In student style politics, pictures of Chamisa flanked by Jabulani Sibanda and members of the Nkomo family found their way to social media. However, Chamisa spoiled his game when he made-up a statement alleging that the Nkomo family considered giving him the late Nationalist's Intonga (walking stick) – a statement the family promptly refuted. What could have Chamisa intended to achieve and what could be the implications of these developments on his campaign? Initially, Chamisa had his reasoning correct – in politics, it is strategic to acknowledge institutions, community leaders, opinion makers and influential people. These structures and individuals are pertinent; they reflect the candidate elect's commitment towards establishing relationships with grassroots communities. Local and community leadership create a platform which facilitates political bargaining processes, such relationships enable candidates-elect to negotiate political undertakings in exchange for votes. In addition, they provide inroads and access for candidates to campaign in their respective communities or institutions. Thus, politicians will go out of their way to initiate strategic relations and negotiate endorsements with prominent individuals and institutions to gain support from their followers. For example, in 2008, during Barack Obama's campaign, Oprah Winfrey came out publicly announcing her endorsement of the then president-elect. Even great grandson of Theodore Roosevelt, Theodore Roosevelt V endorsed Obama. In essence, the endorsements garner mainly positive media attention for a candidate, and the candidate's poll numbers typically increase. These increases generate more positive media coverage, which in turn attracts more endorsements and donations, and rivals are winnowed out of the competition. Chamisa's quest for endorsements is a well-known practice worldwide, but the MDC-T leader exposed his ignorance regarding the process of endorsement. Chamisa sought to solicit endorsements through aligning himself with respected leadership and historical urgings of the people of Matabeleland. However, Chamisa is attempting to gain political mileage by manipulating emotions of the electorate. His utterance regarding the alleged abuse of the late nationalist Joshua Nkomo and the need to ask for forgiveness from his family smells a self-serving agenda. As a matter of fact, the people of Matabeleland found it insulting that MDC-T leaders assume they can win votes by playing the tribal card instead of addressing bread and butter issues. Such kind of politicking is not politically sustainable given the risk it has in fuelling national divisions and ethnic tensions. A representative from the Nkomo family Michael Sibangilizwe Nkomo tweeted that "Nelson did not come to our Pelandaba home, instead he visited the Joshua Nkomo Museum at Matsheumhlope, a public tourist monument open to tourists and all and anybody". The statement above is loaded with meaning, interpreted correctly, it translates to disapproval, not endorsement for Chamisa. The process of endorsement dictates that the person endorsing a candidate reserves the responsibility to publicly declare their endorsements. For example, addressing accountants last week in Harare, well known critic of former president Robert Mugabe Trevor Ncube, took the opportunity to publicly endorse President Mnangagwa for the Presidency. Chamisa erred in this regard, if the Nkomo family had endorsed him, they would have taken the lead in announcing their endorsement – after all they have a democratic right to endorse a candidate of their choice. In the words of President Emerson Mnangagwa "zvoto zvine mazera," the MDC-T leader exhibited immaturity and unnecessary excitement by making reference to a closed-door conversation without consent by parties involved. It is not clear, whether the Nkomo family had an idea their gesture of good will was to be later abused or taken advantage of. Chamisa displayed dishonesty by attempting to take advantage of the family's hospitality for political mileage. It is also mischievous on his part to cause or be part of spreading falsehoods which could potentially harm social and political standing of the Nkomo family. At the same time, Jabulani Sibanda was equally furious after realising the MDC-T leadership used photographs taken with Chamisa to insinuate his endorsements.